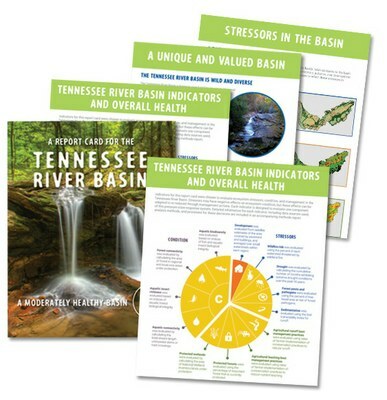 The Tennessee River Basin Report Card was developed as a tool for prioritization and restoration decisions made in the Tennessee River Basin. The report card document is also meant to serve as an outreach tool for use by managers to highlight particular issues of importance when communicating conservation and restoration with the public. 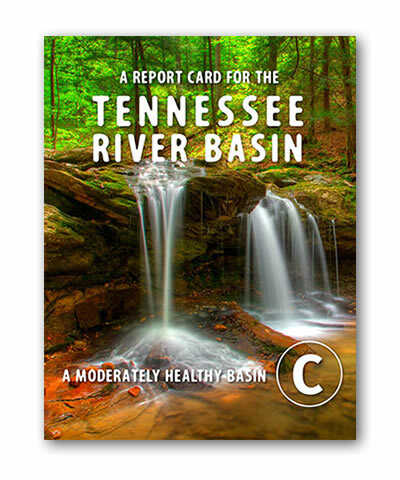 For the “Roll-out” of the Final Research Results by UMD/IAN on the “Tennessee River Basin Report Card within the Appalachian Land Conservation Region.” This “Report Card” approach is a valuable component of the larger, and long-term planning effort for large-scale collaborative conservation in the 21st Century. It represents the commitment of the Appalachian landscape conservation community (AppLCC) previously to fund this a science-based analysis of the current state – and the community identified the Tennessee River Basin area to be the demonstration or Focal Area to deploy this critical science-based information approach. Many of you participated in the series of expert consultations over many months and others critiques an earlier draft shared at the TRB Network meeting in Aug. Your input provided the foundation of this report -- identifying metrics and evaluating "action-based" indicators to help inform conservation planning. Thus we’d welcome your participation as the UMD team share the final “Roll-out” of this important research. Full copies of both the 8-page visual "Report Card" and the more technical methods paper will both be available as PDFs that will then be posted to our website applcc.org for download. Check the home page for the link. Investigators: The Integration and Application Network (IAN) and the Appalachian Laboratory(AL), two units of the University of Maryland Center for Environmental Science (UMCES), worked with the Appalachian Land Conservation Cooperative (AppLCC) to advance a report card for the AppLCC geography (now under the newly forming Appalachian "Landscape Partnership"). The Principal Investigators: Heath Kelsey and Andrew Elmore worked directly with project partners to achieve tasks outlined in the above proposal, including meeting facilitation, stakeholder engagement, assessment of data, and creation of visual elements and the guidance document. Dr. Elmore performed GIS analyses and data analysis and interpretation. Dylan Taillie assisted in the coordination of project meetings, and contributed components of data compilations and analysis under the direction of Dr. Kelsey. Mr. Taillie was primarily responsible for creation of the visual elements and production of the report card document. Scope of Work: the creation of the Report Card involved extensive consultation via web meeting with both Appalachian Partnership and members of the Tennessee River Basin Network at their annual meeting in Aug 2016. Based on the input provided by these stakeholders, metrics were identified to help inform and ‘grade’ the current status of those environmental or socially-important features or benefits. Upon the completion of this project two products were released: a detailed, technical paper on the methodology, and a user-friendly visualization – the “Report Card” – to assist managers and stewards examine the status of the Basins important resources, to consider these factors in identifying follow-up actions and priorities, and to serve as an elegant outreach tool to further engage local communities and decision-makers in considering how best to invest in the Basin to safeguard all the important things that people care about and rely upon that influence their quality of life and cultural appreciate this unique part of our national and natural heritage.